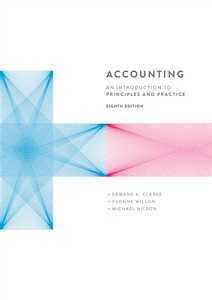 The best-selling decision-making introductory accounting text, Accounting: Business Reporting for Decision Making is now in its 5th Edition. This new edition, updated to reflect the most current topics in business sustainability, continues to cover the basic principles of business decision making using fundamental concepts and tools from the disciplines of financial accounting, management accounting and finance. Focused on the application and interpretation of typical business reports and how accounting information is used in business decision-making processes, the text emphasises the conceptual and business applications of accounting and accounting information, providing clear explanations, applications, and supporting digital resources so students appreciate the significant role of accounting information in all business environments.